If there's anything I have picked up on over this past year (out of a zillion new things that I've been experiencing: first home, being married, getting into this blog, etc) it's the power of words, and of positive thinking. There are a lot of threads to this topic but here’s what’s been on my mind lately: Beautiful Things. I am truly thankful for these things. But it made me inside-smile about what different people would perceive as “The Beautiful Things in Life”. Does it make you think of a flawless artwork? A masterpiece of design? Maybe something which is dearly loved and therefore absolutely perfect… even with its imperfections? What if you believed that you were a Beautiful Thing? That you were created, designed, and dearly loved even with your imperfections? That the things you consider beautiful, are God-given passions and that He loves to see you use your gifts? What if you actually believed it? For real. How would that change the way you work and look at life? 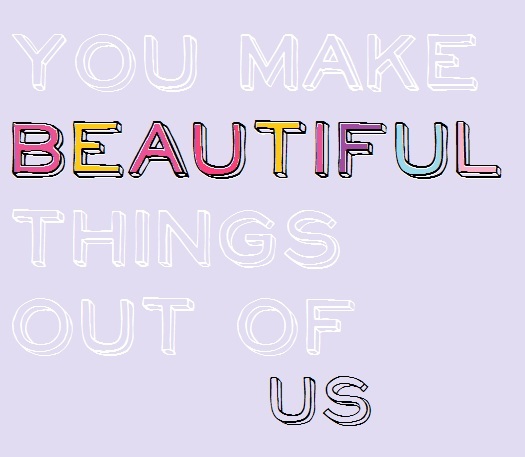 What are your Beautiful Things?